A must for Flexo/Folder/Gluer Load Forming Operations; transfer rate can achieve in excess of 20 bundles per minute. 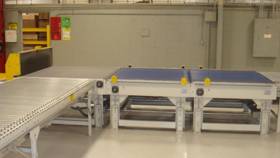 End of Line Transfer Device utilizes the Intralox Activated Roller Belt(tm) technology to provide a continuous transfer for use with bundles of corrugated material. Lateral product movement is achieved by utilizing an “Adjustable” or “Fixed” Backstop to cause product transfer and activation of the rollers in the belting. Unit can also be utilized as part of a Bundle Building System where an operator can determine the desired number of bundles to be released prior to the transfer to maximum the width of the adjoining conveyor. 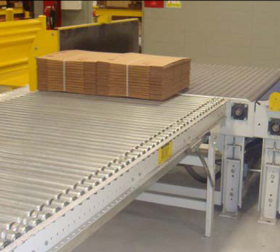 Bundle Building also improves efficiency at a Load Forming operation by grouping material together side by side, reducing the number of operator pushes while increasing the accumulation efficiency of the conveyor. 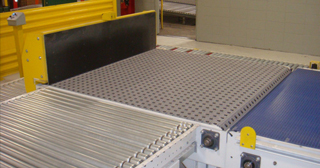 The design of the transfer reduces maintenance needs as there are fewer moving parts and no pneumatics.